Arrangement: Particles are close together and regularly packed. Movement: Particles vibrate around a fixed point. Energy: Particles have less kinetic energy than both liquids and gasses. Arrangement: Particles are close together but irregular. Movement: Particles are free to move. Energy: Particles have less kinetic energy than gasses but more than solids. Arrangement: Particles are far apart and there are no forces between them. Energy: Particles have more kinetic energy than liquids and solids. Watch Daniel Radcliffe sing the names of all the elements – it’s just a shame there are now more elements than were written into Tom Lehrer’s famous song…..
Atom: An atom is the smallest part of an element. Molecule: A molecule is made of a fixed number of atoms covalently bonded together. An atom consists of a central nucleus, composed of protons and neutrons. This is surrounded by electrons, orbiting in shells (energy levels). Atoms are neutral because the numbers of electrons and protons are equal. 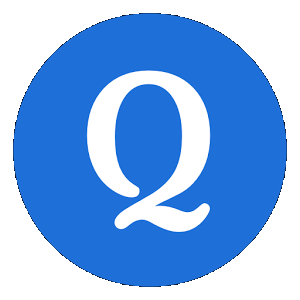 Mass number: The number of protons and neutrons in an atom. 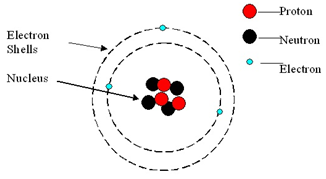 Isotopes: Atoms of the same element (same number of protons) but with a different number of neutrons. Relative atomic mass (Ar): The average mass of an atom compared to 1/12th the mass of carbon-12. The elements in the Periodic Table are arranged in order of increasing atomic number. Columns are called Groups. They indicate the number of electrons in the outer shell of an atom. Rows are called Periods. They indicate the number of shells (energy levels) in an atom. Metals on the left of the Periodic Table. 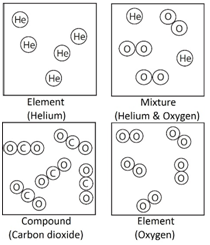 Non-Metals on the top-right, plus Hydrogen.